While I had originally thought I might take in #edCampSWO (SouthWest Ontario) in Tillbury, ON at the last minute, it turned out not to be the case. 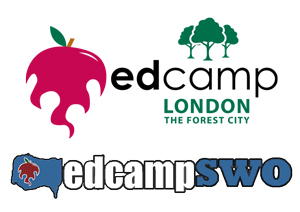 Add to the mix a similar interest in also attending a second Ontario #edCamp being held on the same day in the same end of the province, #edCampLDN (London), and the dilemma truly magnified. What to do? The OSEEMOOC spearheaded by Donna Fry (@fryed) and Mark Carbone (@markwcarbone) has been underway for a little over a month now, and Donna’s current challenge to Ontario educators is to share a “What Did I Learn Today” post with the community. With this in mind, I decided to undertake to explore a “What CAN I Learn Today?” question, with the focus of following two Ontario #edCamps from afar. Face to Face Learning Rocks!